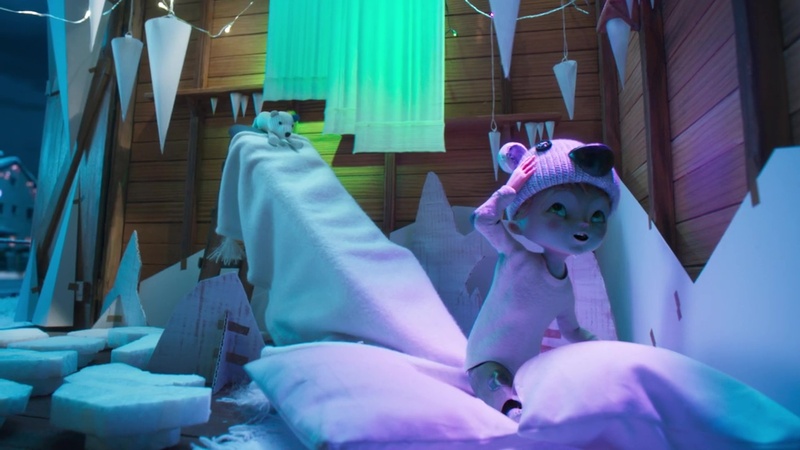 Production house Glassworks Amsterdam and German agency Serviceplan Campaign were among those teaming on “Christmas Doesn’t Need Much, Only Love,” a seasonal film for German discount supermarket chain Penny. The online film mixing live action and 3D animation has had a big impact in Germany where it’s generated more than 22 million views, including 14.95 million YouTube views. Today the film is released globally. Featuring a single mother who cannot make her son’s wishes come true because she doesn’t have enough money, the film has a handmade aesthetic to emphasize the message behind the campaign, that even if you don’t have much money, it is possible to create gifts through love. However, she ultimately finds a way to grant her son a true Christmas miracle – using creativity and love. 2,500 kits were produced to enable people to knit their own teddy bear for Christmas. Customers were able to win the knits by taking part in an online lottery. A new version of Elton John’s “Your Song”, interpreted by Josephine van Schaik, was produced for the campaign. Until December 27, the film was only available online in Germany due to global music rights. In addition to Serviceplan Campaign and Glassworks, digital agency Plan.Net Campaign and Parasol Island are responsible for design and implementation. Client Penny supermarkets Agency Serviceplan Campaign, Germany Christoph Everke, Alexander Nagel, executive creative directors; Matthias Schuster, Moritz Dornig, creative directors; Alessia Coschignano, copywriter; Rebecca Labiner, art director; Nedim Aktas, Iasonas Baliamis, jr. copywriters; Elena Sorokova, jr. art director; Jochen Hirt, producer (@Neverest). Digital Agency Plan.Net Campaign Michael Reill, executive creative director; Marc Hermann Hofmann, sr. copywriter; Alexander Kneifel, sr. art director. Production Glassworks Amsterdam Darren Macpherson, creative director, VFX supervisor, on set supervisor, lead 3D artist, animator, lighting & render; Hugo Rodriguez Rodriguez, creative director, art director, 2D artist; matte painter, storyboard artist, concept artist; Rudiger Kaltenhauser, creative director, VFX supervisor, on set supervisor, lead 3D artist, art director, lead 3D artist, animator, lighting & render; Kyle Obley, on set supervisor, lead 2D artist; Jef Fleurkens, tracking & camera, animator, lighting & render, rigging; Aaron Smith, Davide Uccellani, tracking & camera; Matias Zadicoff, modeler, character styling & texture; Esteban Pedrozo, modeler, character styling & texture; Jose Manul, modeler; Tiaan Frankin, rigging; Callum Austin, rigging, animator, storyboard artist; Alastair Hearsum, Glenn Ewan, Casey Chelchinskey, Jon Park, animators; Roman Hinkel, animator, particles FX; Heidi Stohr, Hugo Perdiz, Zolna Minik, animation assist; Maxence Peillon, Alexander Pattinson, Duncan Malcolm, 2D artists; Benjamin Putland, editor; Scott Harris, colorist; Ariella Amrami, sr. producer; Salt Ibraeva, postproduction coordinator; Lauren Becker, production consultant. Music Sizzer Elton John's "Your Song"; Josephine van Schaik, singer; Jesper Gadeberg, music stylist. Audio Mix m-sound studios Robert Miller, audio engineer. Shoot Second Home Studios Chris Randall, shoot producer/motion control operator; Sam Morris, DP; Luke Unsworth, camera operator/DIT; Ian Whittle, gaffer/rigger; Amanda Haas, studio assistant/prop style assistant. Miniature Sets Clockwork Frog Films Andy Farago, production designer; Steve Lafferty, Johnathan Lawrence, Simon Lipscombe, carpenters/fabricators; Alan Henry, Ruth Harrison, Paul Taylor, Sarah Right, specialist model makers; Kat Simpson, David Riley, Abbie Skinner, Mark Heron, Steph Oakley, model/prop makers; Lucy Sturley, soft props/fabrics; Sara Watson, scenic painter.